In the past six months, I’ve had a handful of experiences that I’ve come to consider gems. These are passing instances that are small relative to world events; that are mostly brief and light, unlike the span and weight that comes with life; that are ephemeral as the second that just passed by. Yet, these are significantly shining, valuable moments to treasure. So when artists Melissa Dubbin and Aaron S. Davidson invited me to participate in their new project with and about gems, I accepted with no hesitation. I wore one of the four precious-stone artworks created by the artists. It was a work in the form of a pendant. This was a roving, intimate display of sorts preceding the artist’s current exhibition, Making a Record (Diamond, Ruby, Sapphire, Emerald). My then pendant has three emeralds: the larger one is the raw, natural mineral; the thinner one is sculpted as a sharp spine, and was used as the stylus to record an album about emeralds; a rounder piece is a cut crystal, like those more commonly seen in jewelry. Emerald was the color of the tunic I was dressed in the day I met Caetano Veloso. That sunny morning, I learned about a song he dedicated to his friend, the artist Lygia Clark. Apparently I gifted that musical theme to someone with whom I didn’t exactly want a friendship. (Where did I go wrong?) Emerald the present’s ribbon. Emerald also the color of the box of pistachio Turkish Delight, those candies savored on the afternoon of farewell to such affair. Hexagon the shape of that little candy box, as the form of the pendant’s largest, natural stone. The gemologist and jewelry designer Karen L. Davidson, who was interviewed by the artists, her words recorded onto the album with the stylus on the pendant, tells that emeralds are a gem considered both fragile but hard; that these have a longer history than most stones; that they are great for one’s vision. It’s been hard not to associate my temporary pendant with other comings and goings that have, at best, arrived and ended because of some misinterpretation, at worst, because of finding indistinguishable the differences between possession and comprehension. Now with the pendant’s physical absence yet its luminosity’s presence, I keep on reconsidering the assumed but most probable fragility of this hard, long-history stone. And so, I recognize that emerald is indeed the color, the mineral, the hexagonal crystal that has accompanied me lately in learning about what bonds, on how intimacy or complicity binds. Emerald is my gemstone. It’s the brilliant companion that keeps me lit even when it’s hard to shine. 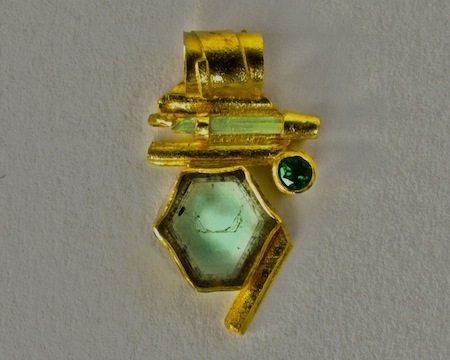 Pictured above is the emerald pendant of Making a Record (Diamond, Ruby, Sapphire, Emerald) by Melissa Dubbin and Aaron S. Davidson, an exhibition on view at Audio Visual Arts in New York City from January 18 to February 17, 2013. Pierre Huyghe, Marina Warner, and Jamieson Webster wore and wrote about the three other pendants.